blatant tribute to the movie "the labyrinth"
before anyone asks, YES, owls can pull their feet up that high.. ever seen one sleeping? this is 11 1/2 x 13 inches on heavyweight bristol paper. WOW, beautiful attention to detail. Hoooh my Dawn, the feels this gave me! I loved the Labarynth, but the Barn Owl made me imagine a Guardians of Ga'Hoole crossover and I got all giddy inside! I cannot believe this is done in MARKER! Wow. I love how you've popped so many different colours in the small neck feathers. How in the world had I missed you? Fabulous! Holy moley! This is beautiful. Looks like it would be Dumbledore's owl! Brilliant! Congratulations on the well deserved Daily Deviation. Bordel de merde, juste magnifique !!! I stand by it Labyrinth was an awesome movie. My daughter & I used to watch The Labyrinth (20+ yrs ago) - and we still like to watch it occasionally! And we still enjoy it. 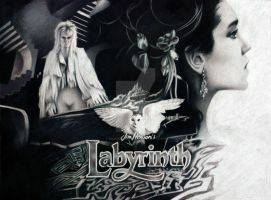 Dud, the Labyrinth is an awesome movie! You did a great job! Keep up all the good work! Just Amazing!!!! I really feel the Magic! Ha! If the ball was a globe of the earth, this guy'd be a great supervillain! Hehe.. "give me all your mice, or I'll hack up a giant gross pellet RIGHT into your oceans!" I find this artwork through searching for Tyto (Barn Owl) artwork so I can add to it the collection of my group. And I have a very good memory, so I practically know each piece in my group; your piece is part of my group. And I and the other staff members do our best that no one is plagiarising the artwork that is inside the group. Indeed, I saw your comment, it is good to be friendly. Also, it seems that the user was heavily influenced by your artwork, as the user had said that she really did like this one and so it is like fan art. Any chance that this original is still available? Even if they were referencing my work (I can't tell for sure) their image turned out different enough that I don't feel like there's any kind of infringement or rules being broke, here.